Colourful rain or a magic umbrella? My kids love having their own umbrellas despite the fact that they rarely get to use them. I’m sure you’re thinking ‘but it’s always raining in Melbourne’ – however the reality of our extended drought has meant very little puddle play or opportunities to get out the wet weather gear. As a result, my daughter takes her umbrella out with her when there are lots of clouds in the sky ‘just in case, Mum’. So buying a seriously cool umbrella from Squid London was probably more of an extravagance than a necessity. 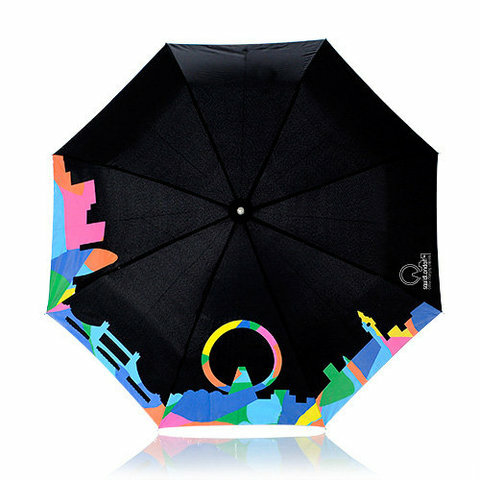 Squid London umbrellas feature simple black and white designs that change colour when they get wet. As the rain falls, the various colours on your umbrella are revealed. There are a few different designs available including paint drips, bird ‘splats’ and the London skyline. Whilst not designed specifically for children, these umbrellas certainly have loads of kid appeal. Bring on the wet weather! The paint drip design is available from the Tate Shop for £25 and the other designs are available from Beyond the Valley for £26. Shipping to Australia is available.